We are currently full but are now accepting reservations for future dates!! Animas River RV Park offers 6 RV parking spaces with full hookups, welcoming adventurers from around the region as they explore the Four Corners area of New Mexico. Pack your camping gear and grab your rod and reel—a great time on the Animas River awaits you! Contact us about rental rates and terms today. There’s no shortage of beautiful scenery and amazing attractions in the American Southwest, but few rival the splendor and majesty of the Animas River and surrounding Four Corners area of New Mexico. Animas River RV Park is your gateway to exploring it all! We’re a quaint, ideally-located RV park in Aztec, NM, giving our guests private access to the Animas River and tons of local attractions and destinations. Whether you’re looking to spend time fishing, rafting or lazing on the river, there’s no better destination. We welcome outdoor lovers of all types and maintain a clean, friendly campsite that honors the landscape and welcomes guests from around the nation. We have 6 RV campsites in Aztec, NM, complete with full hookups for your convenience. Our goal is to provide everything you need to enjoy your time with us, no matter how long you plan on staying. With affordable pricing and flexible terms, we’re able to accommodate you. Make us your destination for a solo getaway, family vacation or friendly excursion—we promise there’ll be no shortage of things to do, sights to see or experiences to have. Enjoy all the Animas River has to offer and don’t be shy about exploring the surrounding landscapes: you’ll experience some of the last true natural landscapes of the region. With 6 sites, Animas River RV Park is the perfect location for your next vacation! Our sites have full-service hookups, including water, sewer and electrical. We’re a member of the local Elks club. We offer private access to the Animas River, just a 1/8 mile walk/drive away. Our location is just a short way from a number of local destinations, for both sightseeing and entertainment. 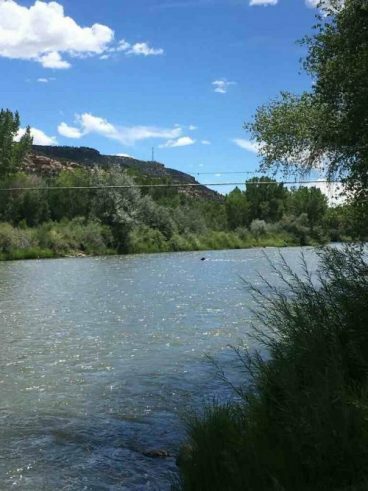 Welcoming campers, fishermen, rafters, hikers, photographers and more, Animas River RV Park offers affordable rental rates for a variety of stays. Contact us today to reserve your spot at our park. "Tranquility at its finest. After exploring the wonders of Monument Valley, Durango and all the four corners has to offer it was absolutely a..."
"I travel quite frequently on business/pleasure from Reno, Nevada to the Four Corners. I have stayed at Mike Heizer’s Animas River RV Park ..."
"What a beautiful place! My wife and I stayed there for three months this spring and plan to stay there this fall on our way to Arizona. The ..."